To avoid any confusion let say the Army denomination is not be mistook for the Type 86 Assault Rifle also built by Norinco. To clear it, the manufacturer designation WZ-501 is also often used. The Soviet BMP-1 was quite an influential vehicle, produced under license and massively exported worldwide. Given the tense relationships between China and USSR since 1979 there was no way for the PRC to acquire it otherwise by indirect sources. In this case, most probably Egyptian. 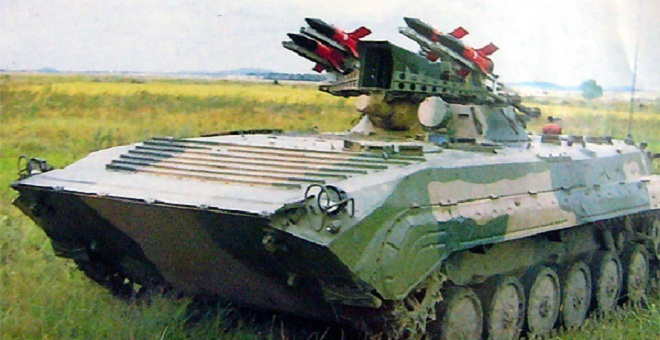 A BMP-1 was then comprehensively reverse-engineered and copied to about 1000 vehicles according to some sources. Despite the first prototype accepted in service dated back from 1987, it only officially entered service in 1992. Norinco’s WZ 501 of the Chinese Marines (southern Guangdong Province). 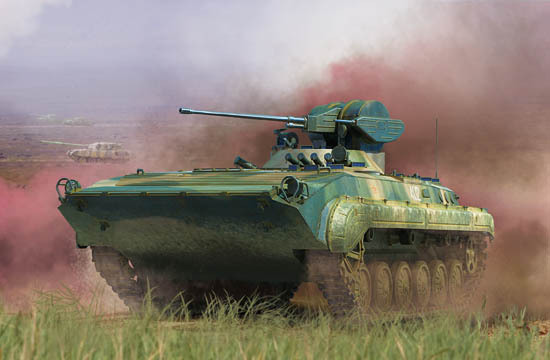 A close copy of the BMP-1 revealed in …1999, was relatively short-lived, pending replacement by the upgraded Type 86A and G in the 2000s. 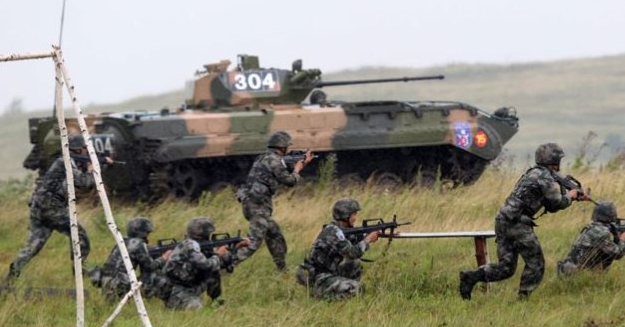 It seems strange for a country like China back in the late 1980s to copy such vintage model instead of the more modern BMP-2 or 3, moreover given its dispositions to built decent local IFVs like the Type 85 or Type 89. It also seems the model was not a hot-heated one-off as to also spawn a significant number of variants, like the WZ503 APC, WZ504 tank hunter, WZ505 Armored Ambulance, or WZ506 Armored Command Post. The Type 86 was apparently exported also to Iraq, Myanmar, and Sri Lanka, as an even cheaper proposition than the original BMP-1. Noticeably also the Type 86 was the base for the modern-days Iranian Boragh IFV, a recent vehicle still in production, which makes this 1960s design alive and kicking! At first glance there is little to distinguish the copy from the original, in fact externally no source can tell any significant difference at all. It could not be however a perfect copy as to use local armaments and sub-systems and probably many internal differences as well, that are left to supposition until one of these is captured and examined by Western Intelligence. 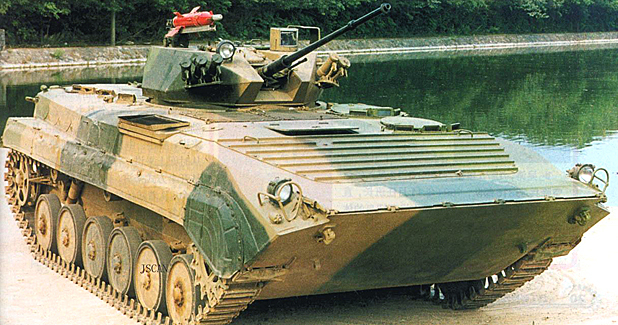 The Type 86 IFV is given an all-welded steel hull with highly pronounced angles that give full protection from small arms fire and shell splinters, and heavier rounds at the front (light auto-cannons and heavy MGs) although at the front it is assumed to be proof against 12.7mm AP/API rounds, the slope makes it artificially thicker. The driver is located front left, with a single-piece hatch. The commander is seated behind, with a peripheral vision rotatable cupola and three day periscopes and an infra-red searchlight is mounted on the commander’s cupola and controlled from inside the vehicle. In fact, infra-red night vision equipment is available for the commander, driver and gunner. The rear troop compartment contains eight infantrymen seated back-to-back which can exit through two rear doors which integrate fuel tanks (60 & 70 liters), a day vision device and a firing port. Four roof hatches, on each side can be also hinged in the center and locked vertically to fire standing on the move with some protection. Otherwise, troops are also given six firing ports each side plus four heated day periscopes on the roof for aiming. The WZ505 receive an NBC system, automatic fire extinguishers, and most are also given smoke dischargers (2×3 or 2×4). In addition, all can use the standard Soviet exhaust manifold diesel injection system to create a massive smoke. Engine and transmission are to the right of the driver’s and commander’s positions, with the air inlet and outlet louvres on the roof. The steering system is at the front. The drive-train consists in six stamped rubber-tired road wheels, front drive sprockets, rear idlers and three return rollers per side. The first and last stations, in addition to the torsion bar units, are given hydraulic shock-absorbers. The double-pin track links types have water scoops between the housings. The top of the track receive a sheet steel cover, normally removed when operating in snow. The Type 6V-150 water-cooled diesel develops 293 hp at 2,600 rpm (standard power 215kW) and is coupled to a manual transmission, 5 forward and 1 reverse gears. As a result this IFV could climb a gradient of 60% and cross a trench of 2 m at best. 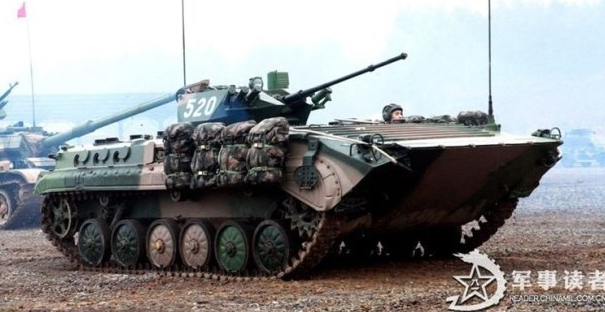 The WZ505 is fully amphibious, propelled by its tracks at a maximum speed of 8 km/h. The trim vane stored at the front, acting as supplementary armour is erected and bilge pumps activated. 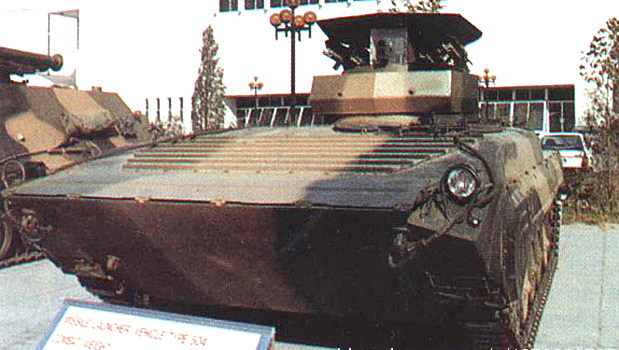 The combination is similar to the BMP-1 but with Chinese equivalents. The one-man conical turret contains a 73 mm smoothbore gun (40 rounds in store, mostly HE-frag, elevation +30°, depression -3°) and a 7.62 mm coaxial machine gun (2,000 rounds and tracers). There is a launcher for a Red Arrow HJ-73 anti-tank missile. One ready to fire and four more are carried internally for manual reloading. Maximum range of up to 3 000 m. This armament is changed on later versions. The APC is given the standard Chinese 14.7 mm heavy machine gun, the modernized IFV Type 86A a 20 mm autocannon, or a 14.7 mm HMG in turret in the export variant. Both can fire HE-frag or AP rounds with much more accuracy and superior rate of fire. – WZ 503 APC: Single rear door right-opnining, individual side seats, one 12.7mm heavy machine gun. – WZ 504: Tank Hunter, four Red Arrow 73B wire guided ATGWs in raising pod, sighting system in between the launchers. 12 more carried inside. – WZ 501A: One-man turret 25mm autocannon + 7.62mm coax LMG. – WZ 505: Armoured Ambulance, raised rear superstructure for four stretchers/2 stretchers+ 4 seated/8 seated. Spec. Air conditioning, oxygen, spec. medical equipment. – WZ 506: Command vehicle. Additional comsat equipment, 4 radio antennas. 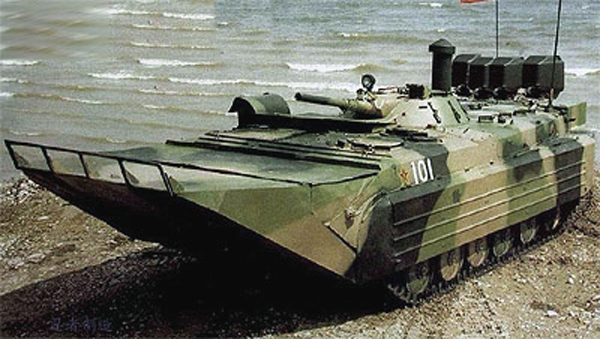 – Type 86B: Amphibious IFV, Chinese Army Marine Corps. 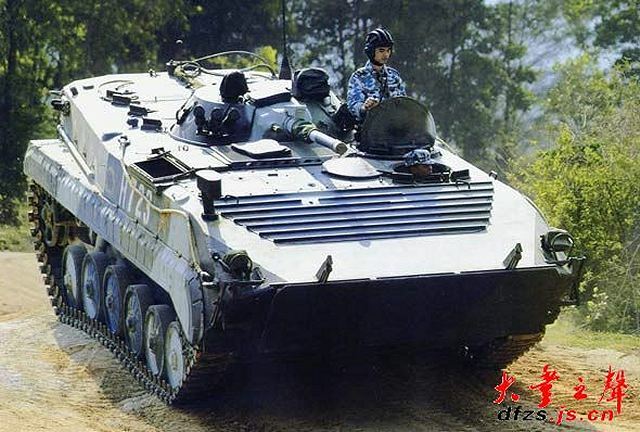 – Type 86G: Improved variant IFV, one-man turret 30-mm cannon, HJ-73 ATGM launcher, new standard being built. The Type 86 entered service in 1992 (nearly thirty years after the original BMP-1) and was seen for the first time during a military parade in Beijing late in 1999. However, this is a modern vehicle, faster than the original. Although this is mere speculation, there could some internal safety modifications following the study of Soviet losses reports in Afghanistan. Lessons could have been integrated into the design. 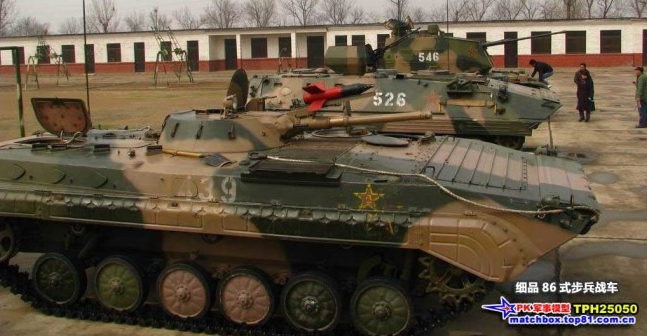 The Type 86 has been estimated in service with over 1000 vehicles both with the Army (stationed in Northern China) and Marine Corps (southern Guangdong Province). Many could have been converted since to the Type 86A or in recent years, the Type 86G, although these are believed to be new constructions. It has brought a lot of tactical lessons as well in the use of IFVs despite its limited introduction, and pending replacement by a 2nd generation IFV. 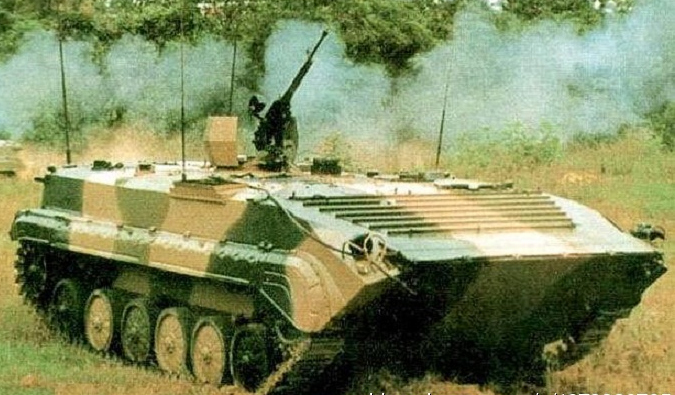 The Type 86 was allegedly exported to four countries: Iraq (no photo, yet to confirm), Iran (To develop the Boragh), Myanmar (no photos, no record, could have been mistaken for the Type 85 AFV) and Sri Lanka (no photos or record, could have been mistaken for the BMP-1 of which 13 are in service). Type 86 APC or WZ503. In this one, there is a single door at the rear, and individual seats are disposed along the hull walls instead of having central back-to-back, facing outwards seats. Type 86A IFV, the modern version of the Type 86, new standard for upgrade since the 2000s. Type 86G IFV, with a 30 mm autocannon and Red Banner ATGM HJ-73. These are currently replacing the Type 86 currently in service. The one-man turret is also shared by the ZLC-2000 airborne combat vehicle. The Type 86G could be either an upgrade or new construction. Trumpeter kit Type 86A artist impression.